POLARIS (Alpha Ursae Minoris). Not seasonal, always there in the northern nighttime sky, Polaris, the North Star, marks the North Celestial Pole. For those in the northern hemisphere it is a navigator's benchmark, the elevation above the horizon closely equal to the observer's latitude. Actually, Polaris is slightly off the pole and has a tiny circle around it about 1.5 degrees across. The pole itself, about which Polaris goes, marks true north, the fundamental direction for us in the northern hemisphere that defines the others, east, west, and south. Because of the 26,000 year precession (wobble) of the Earth's axis, the pole of the sky is slowly moving closer to Polaris, and then when the separation hits about 14 minutes of arc around the year 2105 will start to pull away. Thousands of years from now, Polaris will be well off the pole, other stars someday taking its place. Polaris also marks the end of the handle of the Little Dipper, the prominent figure of Ursa Minor, the Smaller Bear. Polaris (the jewel in a small semicircle of faint telescopic stars called the "Engagement Ring") is centered in a six-degree-wide field of view that shows a variety of other "polar stars." Lamdba Ursae Minoris is the reddish star up and to the right of Polaris, while Yildun (Delta UMi) is the brighter of the two stars at the upper right corner. Roughly between Lambda and Polaris lies the North Celestial Pole, around which they all seem to revolve. The star immediately down and to the right of Polaris is HR 286. Much fainter than its "Big" counterpart, the Big Dipper, the Little Dipper is hard to find in a bright sky. 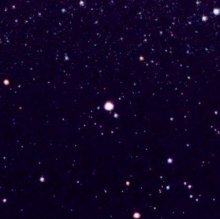 Polaris has the common reputation of being the brightest star in the sky, whereas near dead-on second magnitude (2.02) it comes in at number 48. Its lower rank, however, is largely determined by its great distance of 430 light years. The star is actually an evolved class F (F7) yellow supergiant 2500 times more luminous than our Sun with a temperature of about 6000 Kelvin, which leads to a radius 45 times that of the Sun and a mass of six times solar. Hydrogen fusion has stopped in the star's core, and it is now passing through a phase of instability wherein it pulsates over a period of about four days, almost invisibly changing its brightness as the brightest "Cepheid" variable star in the sky. The prototype of this kind of star, Delta Cephei, though fainter, is a much more obvious variable, its changes easily seen with the naked eye. Polaris, on the other hand, varies by only about 0.03 magnitudes over a 3.97 day period. Cepheids are paramount distance indicators in astronomy, as their true brightnesses are revealed by their periods of oscillation. Polaris is particularly interesting as the pulsations have nearly, but not quite, ceased. Just as a violin string has a "fundamental" tone that gives its pitch, it also vibrates in higher-frequency overtones. Comparison with other Cepheids shows that Polaris is pulsating not with its natural fundamental period, but in its first overtone. The star may be in the process of evolving into its fundamental period of 5.7 days to become a more-normal Cepheid with a greater variation. Not content with polar and Cepheid status, Polaris has the distinction of having a pair of companions, one near, the other far. About 18 seconds of arc away lies an eighth magnitude F3 1.4 (or so) solar mass dwarf, which at the distance of Polaris must be at least 2400 Astronomical Units away and take at least 42,000 years to orbit. Much closer is an F7 dwarf (noted from spectroscopy and resolved by the Hubble Space Telescope, giving us three F stars in one pot), that at a measured average distance of only 17 AU takes but 29.6 years to go around, a high eccentricity running it between 27 and 6.7 AU. A partial orbit gives a mass for the companion of 1.25 solar and that for Polaris itself of 4.3 solar (with an uncertainty of 1.1 solar, which would bring it close to the mass found from luminosity and temperature). Further data will give better masses, crucial for testing the theory of Cepheid variables.